The purpose of the document called "Green Card" consists in certifying that the vehicle for which it has been issued possesses a sufficient third party liability insurance cover when crossing the border of a foreign country. The Green Card is issued by 47 insurance bureaux of mostly European countries, which are all affiliated to an umbrella organisation, the Council of Bureaux (CoB). The Swiss National Bureau of Insurance (NBI) is a member of the CoB. By virtue of this affiliation, it has to follow the requirements set up by the CoB when it issues its Green Cards. The NBI authorised its member companies to issue Green Cards on their own. The Green Card has to be ordered from the insurer with whom the vehicle insurance policy has been concluded. In most cases, the insurers automatically hand out a Green Card after the conclusion of the insurance contract. 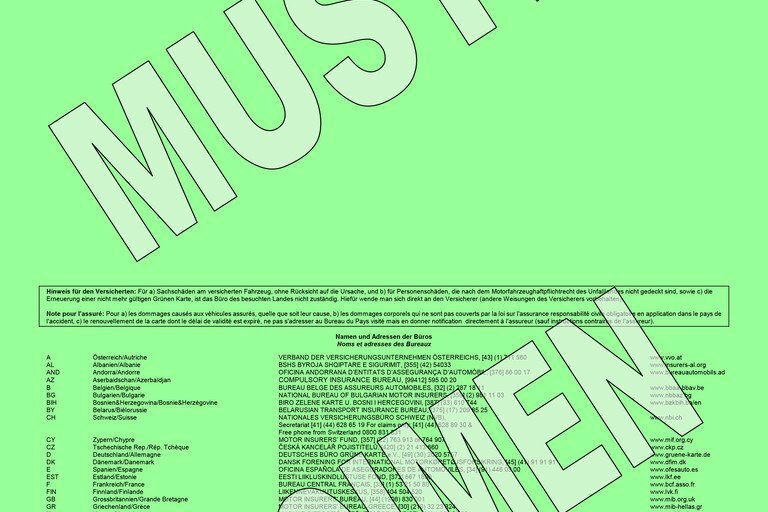 During its General Assembly, 2008 the CoB has approved a new Green Card model. This document has subsequently been approved by the UN (ECE). 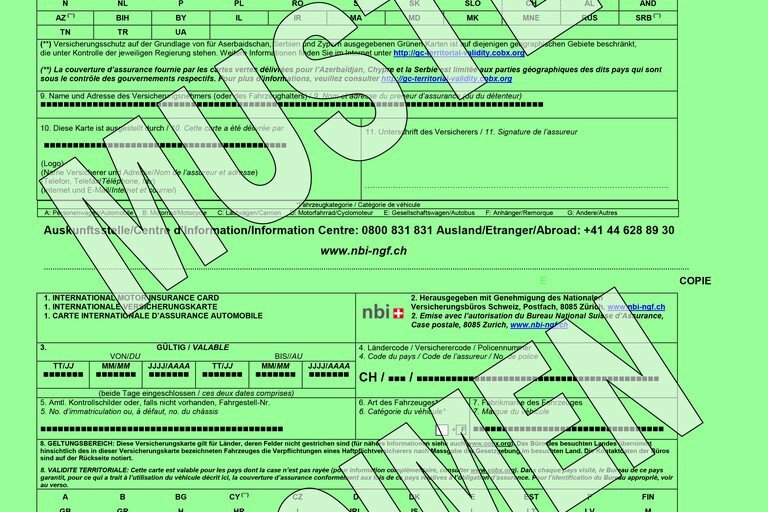 During its meeting held 27.11.2008, the NBI & NGF Management Committee has also approved the new format (the Swiss version includes the NBI-logo as well as information concerning the Swiss Information Centre). The new Green Card model is compulsory since 1.1.2011. Old Green Cards issued before 1.1.2011 remain valid until their expiry date (second date in field Nr. 3). A Green Card issued in the old format after the 1.1.2011 will be considered invalid. It can be confiscated by the border authorities. Since 1.1.2011, national insurance bureaux and motor third party liability insurers are entitled to issue Green Cards according to the new model exclusively (cf. above). Old Green Cards that were issued before the 31.12.2010 remained valid during the period of validity mentioned in field Nr. 3, which could not exceed 5 years (31.12.2015). Since 1.1.2016, these cards are not valid any more.